Tim Holtz and his 12 Christmas Tags are almost a December craft tradition. Over at Scraptivity we decided to change up the season and create our own 12 Tags of Summer. Every day one of the design team will post a new summer tag, and everyone has two weeks after they all have been posted to complete their own set of Summer Tags. Here is my summer tag based on his Christmas Tag Day 12 from 2008. You can create your own tags based on one of the samples or be creative and create your own! It is a great way to use up some of the bits and pieces in your stash. With it being cold and wet here, its nice to dream of summer sunshine! Those are beautiful! 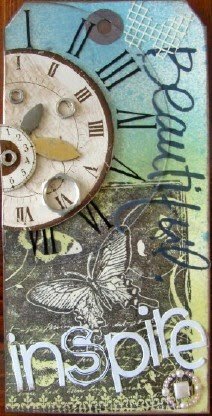 Love the paper and the clocks.